Printmaking techniques deliver results you can get no other way. 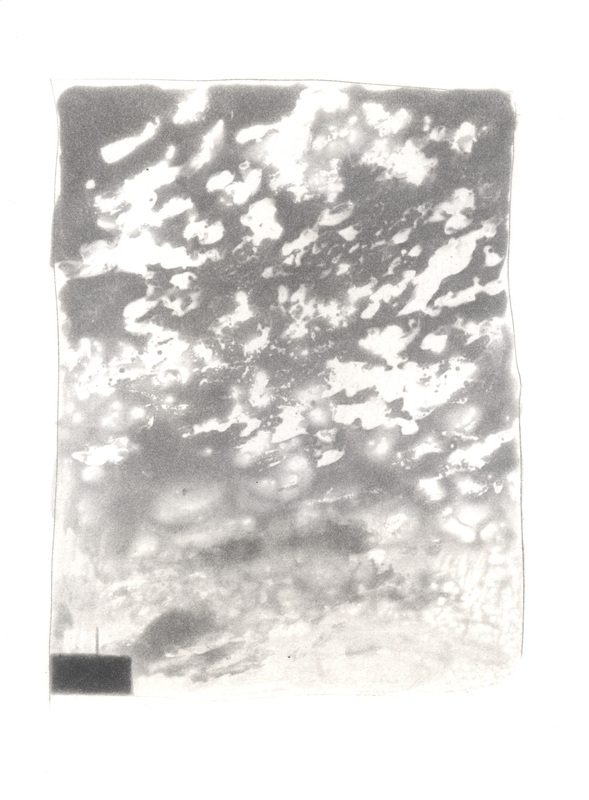 My favorite example is my aquatint, Sky from the portfolio Five Days/Five Nights. I have been trying to achieve soft-edged clouds like these in watercolor for years, but the task of dissolving many complex watercolor edges at once is impossible because the paper dries too quickly. An intricate field of graduated tones as seen in Sky is easily achieved in aquatint. To make an aquatint, very fine particles are sprinkled across the printing plate and attached by heating the plate. Acid mixed with Karo syrup is used to paint selectively on the plate; diluting the acid cuts it to the proper potency while keeping it from simply beading up on the metal plate. The mixture burns into the printing plate wherever it is applied cutting microscopic channels around the tiny particles adhered to the plate. These recessions hold the printing ink. To create the clouds in Sky, the aquatinted plate was first painted in selected areas with clear Karo syrup containing no acid. These points are the areas where I wanted white clouds to appear, so acid is gently blocked at these points. I then painted on top with acid mixed with brown Karo. Unprotected areas of the copper printing plate were eaten into while slowly breaking down the edges of the clear blocking Karo syrup which created the soft gradations of tone. The impetus for the Sky image came to me while working at Center Street Studio print workshop in Boston. After a particularly grueling and unsuccessful day in the shop we went to printer/publisher Jim Stroud’s rooftop. The cumulus clouds that rushed by us were nothing but pure inspiration. The next morning I dove into a small aquatinted plate with the Karo syrup/acid mixture, working without sketches. The adventure with this plate was the turning point in my five days of experimentation which resulted in the portfolio of ten aquatints Five Days/Five Nights. 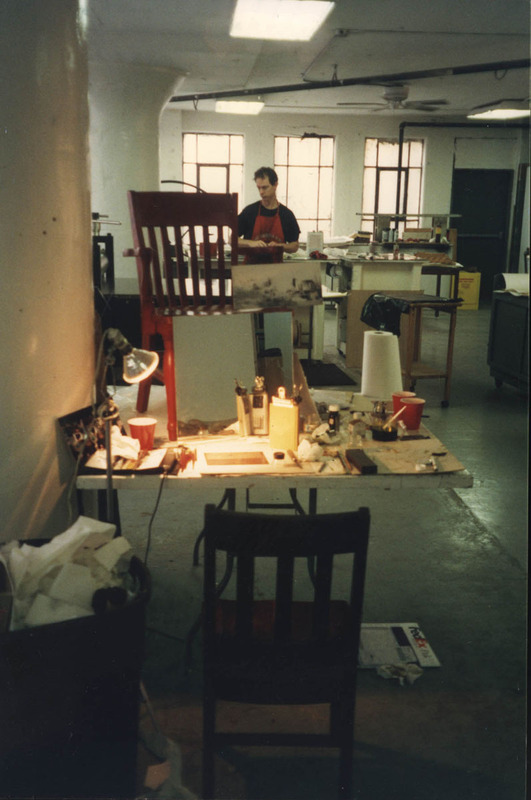 (above) Photograph of the artist’s spitbite aquatint worktable as it looked in April 1999 at Center Street Studio in Boston, Massachusetts. Printer James Stroud is in the background. The term spitbite aquatint means that the acid was selectively applied to the printing plate rather than immersing the plate in an acid bath. The term spitbite is derived from the fact that saliva was in earlier times mixed with the acid rather than a gum substance such as Karo syrup. Note: the acid is actually a caustic agent, Ferric Chloride. 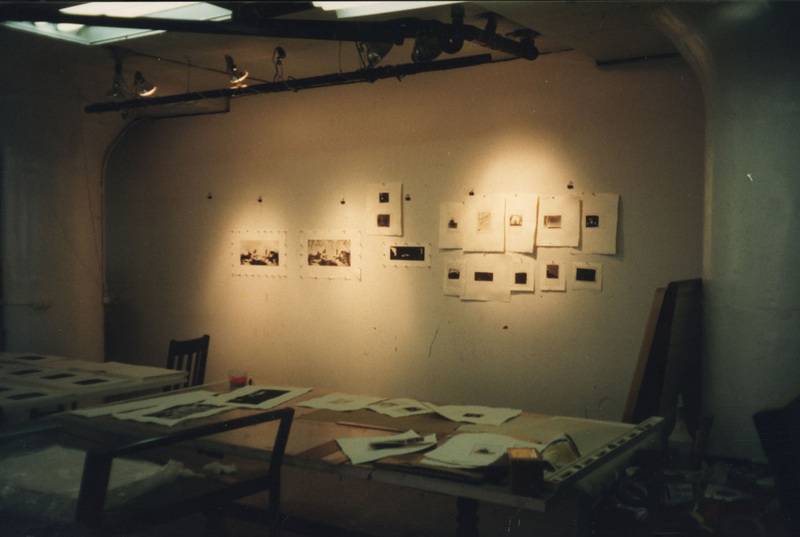 Also note, the photograph above shows the artist’s journal, the image source for many of the Five Days/Five Nights prints, held open with clamps in front of a small mirror, a method that subverts the natural image reversal that occurs in printmaking. (above) The ten proofs for Five Days/Five Nights are seen at right on the proofing wall at Center Street Studio.